As the U.S.-China trade war picks up steam, the repercussions are becoming increasingly obvious to the American people—particularly farmers, most of whom live in red states that voted for President Trump in the 2016 election. The latest development: Last week, soybean futures dropped to their lowest point in more than nine years, after the Trump administration announced tariffs on $34 billion of imports. In retaliation, the Chinese government has announced its intention to impose a 25 percent tariff on 545 U.S. products, including soybeans. 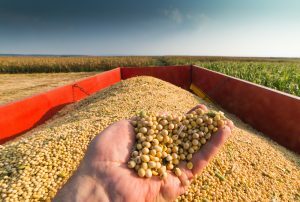 Although soybean futures have gone up a little bit since that low point, they have still fallen about 12 percent since March, when the trade dispute between the U.S. and China began. And it’s hitting farmers in the wallet. In February of 1979, farmers from the American Agriculture Movement organized a tractor rally in Washington, D.C. Thousands of farmers drove their tractors to the National Mall, where they demanded more pay for crops and lobbied for an increased role for small farmers in agricultural policy decisions. They were originally brushed off as a nuisance because they were causing damage to the National Mall, but after a blizzard hit the city on President’s Day weekend, the farmers became heroes because they helped to dig out D.C., transported doctors and nurses to hospitals, and the farmers’ wives served as cooks and cleaners because regular staff couldn’t get to work. Since then, the American Agriculture Movement has played a key role in agricultural policymaking. Iowa, for example, is the nation’s second largest soybean grower, having produced 562 million bushels last year. The Des Moines Register says Iowa farmers could lose up to $624 million, depending on how long the tariffs are in place and how quickly farmers can find new markets for their product. The paper also said that farm income has decreased significantly over the past five years as commodity prices have fallen, and Iowa farmers in particular have seen their income shrink nearly 75 percent. In Arkansas, soybeans are the state’s largest row crop. The state’s farmers collected 178.5 million bushels of soybeans, of which about 40 percent are exported, largely to China. Meanwhile, in Ohio, the Newark Advocate reports that the tariffs on soybeans and corn could decrease an Ohio farmer’s income by 59 percent and a farm’s net worth by 6 percent. 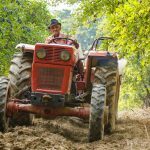 For farmers, many of whom are already operating on a very narrow margin, this could be a huge problem. More than half of the soybeans produced in the United States go to China. If China imposed a 10 percent tariff on U.S. soybeans, total American soybean exports could drop by 18 percent, according to a study for the U.S. Soybean Export Council by Purdue University. If China imposed a 30 percent tariff, total U.S. soybean exports could fall 40 percent. Even if soybean prices do recover and the trade war between the U.S. and China eases off, American farmers, many of whom supported Donald Trump because he promised to help them, are going to be hit where it hurts: their income.